(337/12) 222-228 Hyde Street, flats. Three five-room units. 3B stories; brick structure; decorative brickwork, cast stone trim; two-part commercial composition; Renaissance/Baroque ornamentation; vestibule with terrazzo floor, marble walls, coffered ceiling. Alterations: storefront replaced with wood and aluminum, security gate. Trompe l’oeil mural on south wall by John Wullbrandt, 1983. Original owner unknown. Architect unknown. 1911. (337/13) 230 Hyde Street, Columbia Pictures Corporation (1932-1937); film exchange. Two stories; reinforced concrete structure with stucco facade; decorative cast panels with grapevines; Moderne style; lobby with decorative tile floor. Original owner: Bell Brothers. Architect: W.D. Peugh. 1931. 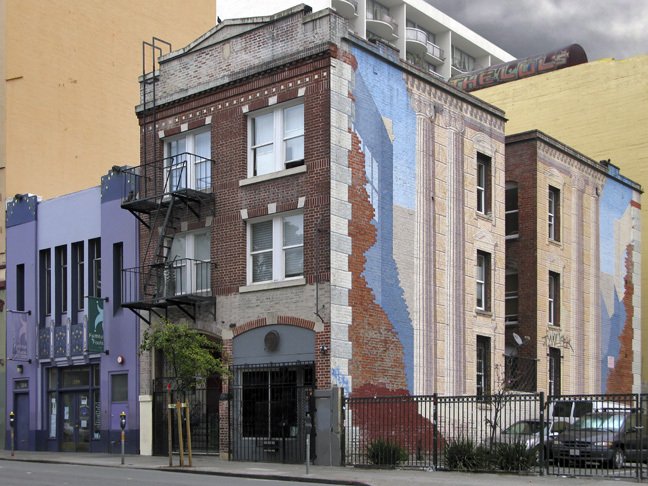 Though nearly thirty years old, John Wullbrandt‘s trompe l’oeil* mural is still an eyecatcher (see also Epitaph – the Black Hawk.